Well, I have two customers that when I need to trace down a cable, its a real bear because I can not see the wall jack numbers to know where to go in the wiring closet. They have these huge desks in the way that I simply can not move. The kind you build when you get them in the room, and once you get them built, they are in there. I have thought about getting an extendable mirror, but in a pinch, I had to come up with something and quick. So, I came up with this little thing below. 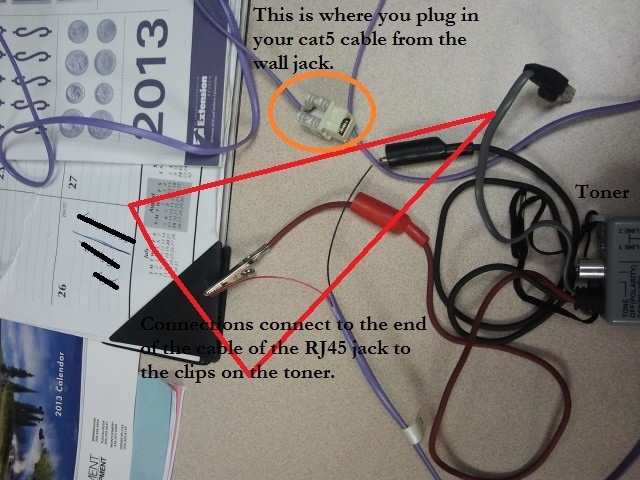 I punched down a phone cable into a RJ45 jack and clipped my toner to the ends of two of the copper cables inside the phone line. So, instead of moving the desk (which would be impossible), I just took the cat5 cable out of the IP phone (in this case, could be a computer) and plugged it into my RJ45 jack. Now, I didn't have to move my desk. I just created an extension for my toner, which works really well by the way. See below, and hopefully this is helpful to you all who don't like to move desks.